Provide Safe and Reliable Service to Your Campus Population. The great thing about modern campus life is that students, faculty and staff are generally quite tech savvy and understand the benefits to connectivity. 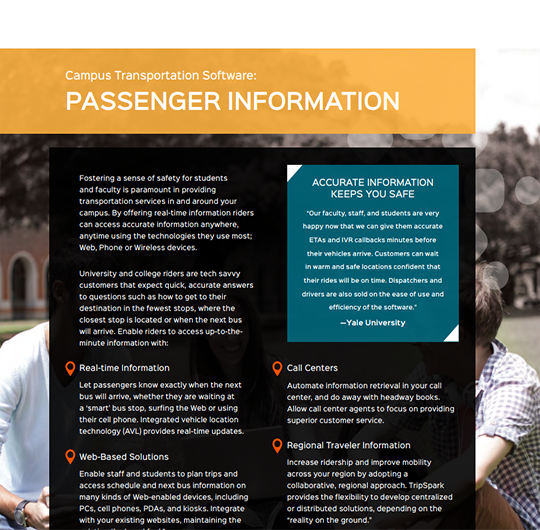 TripSpark has designed a unique campus transportation software solution to help educational institutions offer a best-in-class transit service while balancing budget demands and speed of implementation. Improved transit service will reduce congestion on roads as well as in campus parking lots. This is done by focusing upon the specific needs of both the dispatchers and the riders. Provide more dependable services by connecting to your riders and maintaining predicatable transportation services. Integrated mapping allows you and your riders a better view of the entire transportation system. With more accurate data collection, call takers can respond to calls with certainty and confidence. Friendly fixed-route functions allows you to design and create recurring stops into the system so riders require less direct attention. Communicate with drivers better by using digital, real time communication services. Receive more accurate data due to electronic manifests and simple logging procedures. Drivers log trip info for demand riders, pre and post trip checklist, turn-by-turn driving instructions, book flag trips, text message, VOIP functions, and more. Inefficiencies have a negative effect on not only service, but also the operating budget. Track all vehicles to determine optimal schedule and refine routes to address service shortfalls. Let passengers know exactly when the next bus will arrive, whether they are waiting at a stop, surfing the web or using their cell phone. Send real-time updates to passengers via text message or email. Book subscription or casual trips with full access to accurate passenger details. Use and track information including multiple addresses, special needs, trip history and more in order to provide very personalized service. Accept flag stops by reducing the impact on your planned schedule. Quick learning curve because software is intuitive and user-friendly. This helps you to have more control, book more trips and answer more calls without having to add more costly resources. Scheduling and routing power helps riders connect to regional transit routes. This gives riders more options and makes transit a more attractive choice for those that live off-campus and for visitors to your campus. Enabling riders with access to up-to-the-minute information. Create optimized routes and generate trips and schedules quickly and with minimal training. Real time data collection allows all stakeholders to make fast and informed decisions. Provide a single point of logon for drivers and integrates all data with office software. 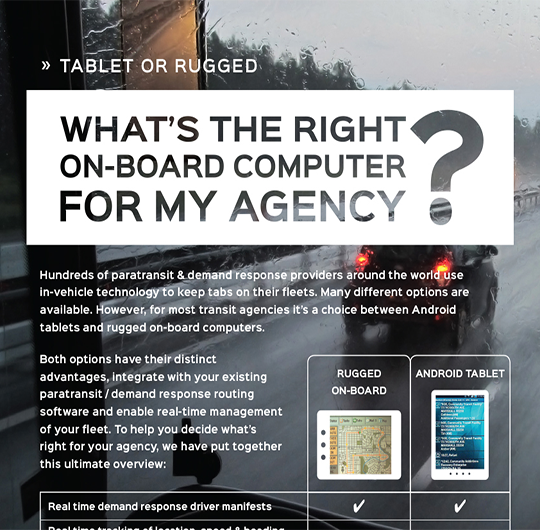 Making it remarkably convenient for riders to access real time schedules on any device. Create, track, schedule, and communicate detours with ease and efficiency. Go paperless or add smartcards and make it easier for riders to pay for their fares. 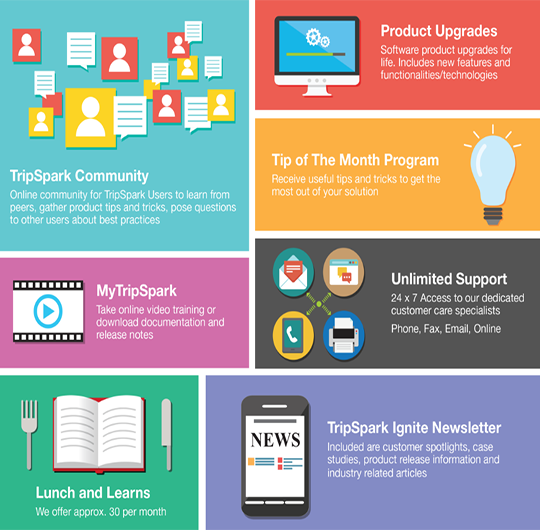 With little expertise, create dynamic reports. Then share them in popular formats. "Football game days and other game days are always a challenge for us. On a football game day we’ll have about 100,000 fans in in the stadium and about 25,000 of them will be riding on our buses. With TripSpark we can monitor the passenger counts and keep track of when the passengers are going where and that will help us to apply the buses as we need to." 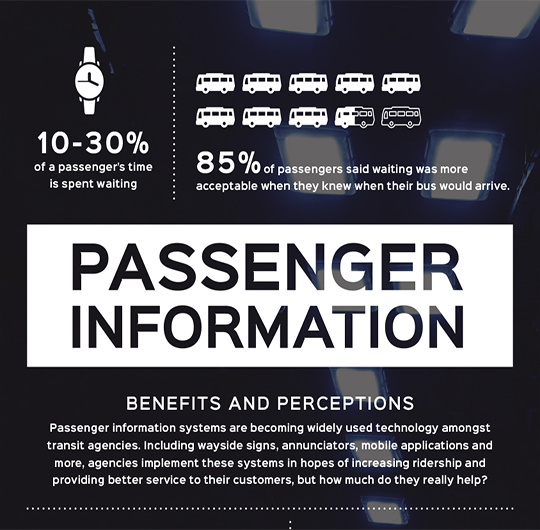 QUICK PIC: The Effects of Passenger Information on Ridership.